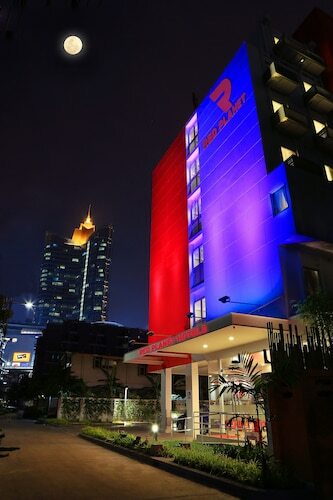 Located in Ramkhamhaeng, this hotel is within 3 mi (5 km) of Ramkhamhaeng University, Bangkok Hospital, and Rajamangala Stadium. Nine Center Rama 9 and Assumption University-Huamark Campus are also within 3 mi (5 km). Ramkhamhaeng Station is 18 minutes by foot and Bangkok Khlong Tan Station is 24 minutes. 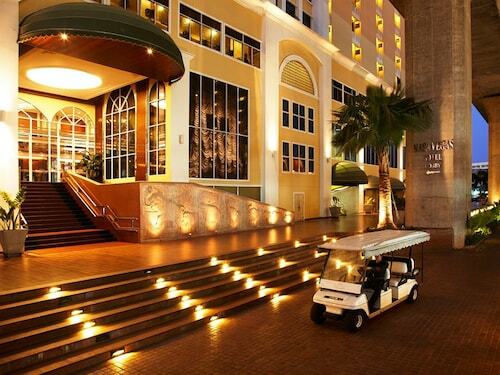 Located in Bangkok City Centre, this hotel is within a 15-minute walk of Sri Mariamman Temple and Lumpini Park. MBK Center and Iconsiam are also within 3 mi (5 km). Sathorn Station is 7 minutes by foot and Chong Nonsi BTS Station is 7 minutes. 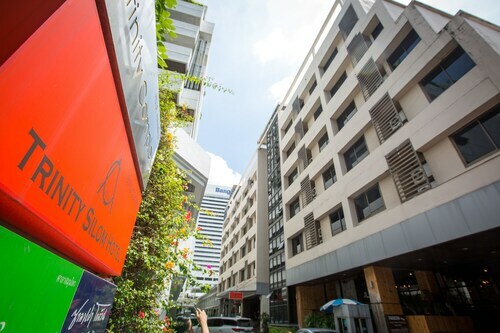 Located in Bangkok City Centre, this hotel is within a 15-minute walk of Patpong Night Market, Lumpini Park, and Thaniya Plaza. Bangkok Riverside and BNH Hospital are also within 1 mi (2 km). Chong Nonsi BTS Station is 10 minutes by foot and Sam Yan Station is 11 minutes. 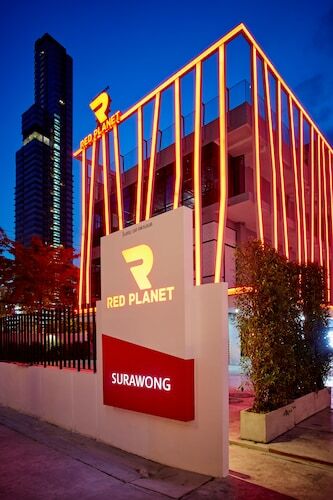 Located in Sukhumvit, this hotel is within a 5-minute walk of Terminal 21 Shopping Mall and Soi Cowboy. Emporium and Nana Square are also within 1 mi (2 km). 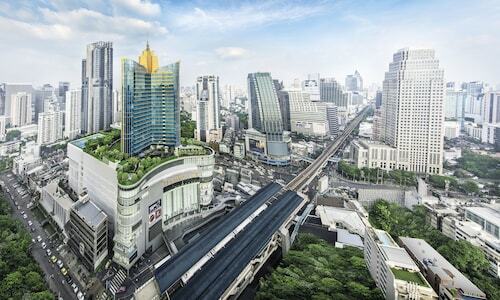 Asoke BTS Station and Sukhumvit Station are within a 5-minute walk. lebua at State Tower features a prime location near the Chao Phraya River as well as access to BTS SkyTrain and hi-speed expressway. The entire city is within reach, with many attractions just minutes away. The property is also only a 15-minute drive to Asiatique The Riverfront. This Bangkok hotel is located five kilometres (3.11 miles) from the Grand Palace and Emerald Buddha, Temple of Dawn, and Jim Thompson House. 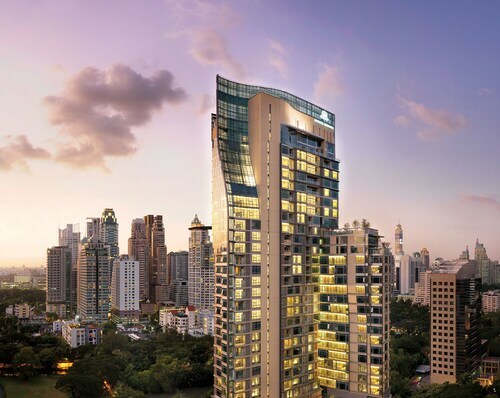 Commanding a prime position surrounded by the lush trees of Wireless Road in the heart of Bangkok's business and embassy district – residents enjoy a unique location unlike any other in the city. How Much is a Hotel Room in Bangkok? 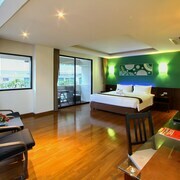 Hotels in Bangkok start at C$23 per night. Prices and availability subject to change. Additional terms may apply. You sit, silent. Alone with your breath and racing thoughts, you inch closer toward inner peace with each calming inhale and mind-cleansing exhale. Images arise. You breathe them away as your lungs rise and fall. You are one with your entire being in this moment, this tranquil, precious moment. The sweet, musky smell of incense tickles your nose, reminding you of your physical connection to the earth and cosmos. The sensation of unwanted, negative energies leaving your body is followed by a rush of positive, affirming vibrations filling the void and making you whole. With each deep breath in, serenity blossoms; your lips curl after each breath out resulting in a gentle smile. A faint bell chimes, bringing your focus back to the present. As you slowly open your eyes, your awareness informs you that you are not on a cushion on your bedroom floor having concluded your daily ritual of morning meditation. Instead, your gaze is fixed upon the small jadeite figure perched on the pyramid-like alter outside your hotel in Bangkok. Understanding that the search for enlightenment begins from within, your quest has taken you to Wat PhraKaew—the Temple of the Emerald Buddha—in Bangkok. Feeling in accord with the universe, you reverently leave the most sacred Buddhist temple in Thailand and head back to your Bangkok hotel with a renewed sense of self. Tomorrow, you will take another step in enlightenment’s direction. Downtown Bangkok is where you will find not only the Temple of the Emerald Buddha on your quest for clarity, but many other Thai treasures as well: the ornately designed Grand Palace where generations of Thai royalty have resided, SanamLuang Park’s oasis of green, and Khao San Road where backpackers and locals enjoy each other’s company at neighborhood bars. Every road seemingly leads downtown and there are so many attractions throughout the nation’s capital. So, when you are deciding where to stay in Bangkok, try an outlying district. 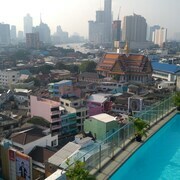 Travelocity can help you find great Bangkok hotel prices on rooms all across town. Here are some of our favorite neighborhoods and a hotel option or two for each. 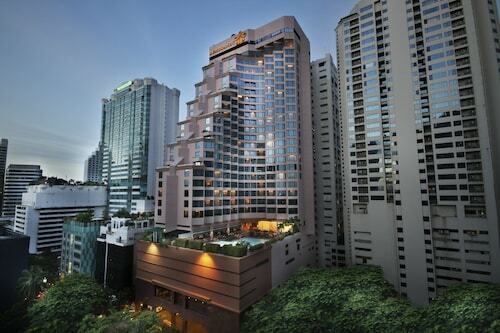 Shangri-La Hotel, Bangkok: As you enter the property from the neighborhood, the contemporary hotel mirrors the surrounding skyline. However, pass through the lobby and exit to the riverfront plaza and you will see a tranquil garden of palms that aptly signifies the hotel’s name. Guestrooms are elegantly decorated in silks and teak and every one offers a sweeping view of the city or river. And, with nine in-house eateries, there is sure to be a dish for every desire. 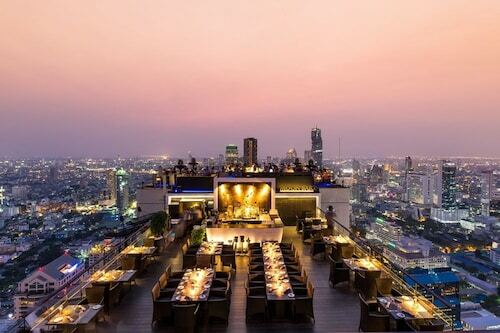 lebua at State Tower: From fine dining restaurants on street-level to rooftop bars with breathtaking views, the lebua is a modern monolith of impeccable refinement. Every room is a spacious suite with a private balcony, free Wi-Fi, walk-in shower, and even washer and dryer. 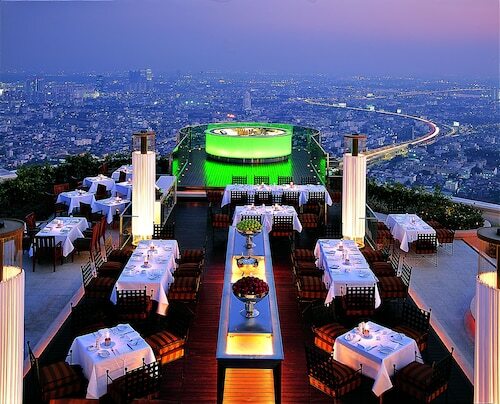 Hotel services include an on-call doctor, limousine transportation, and in-suite dining from restaurants at The Dome at lebua. 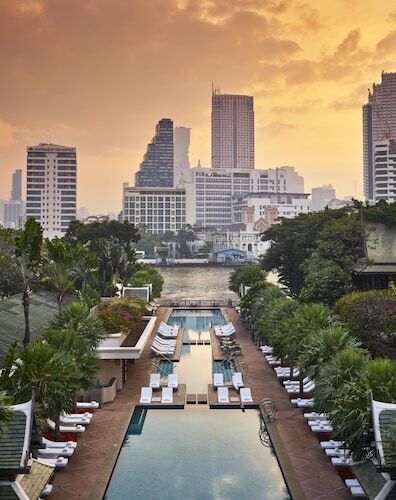 The Sukhothai Bangkok: When royalty and celebrities visit the city, they gravitate toward the Sukhothai. Indulge in luxury with teak-floor bathrooms, a special pillow menu, and a courtyard garden that includes several lotus ponds. Unwind with a dip in the outdoor swimming pool, blow off some steam in the fitness room, or have your tensions soothed away with a treatment at Spa Botanica. When hunger strikes, choose from three fine-dining restaurants or succumb to the urge of Salon’s chocolate buffet. 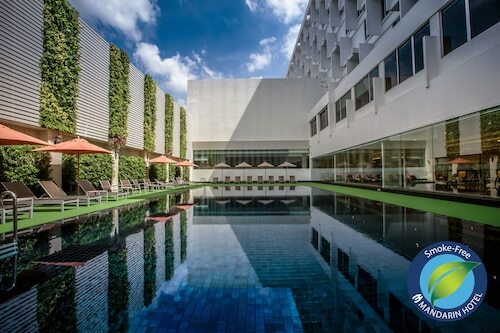 Novotel Suvarnabhumi Airport: Not only is this 4-star hotel on the same parcel of property as the airport, there are no set check-in or checkout times in case your flight brings you into town at an odd hour. 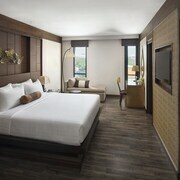 The modern guestrooms offer a marble bath, large work area, and free Wi-Fi. In addition to the options contained within the airport, Novotel guests can dine at Kinsen for upscale Japanese fare, or enjoy a cocktail and a light snack at the Atrium Terrace. When you use Travelocity to book your stay in Thailand’s capital. 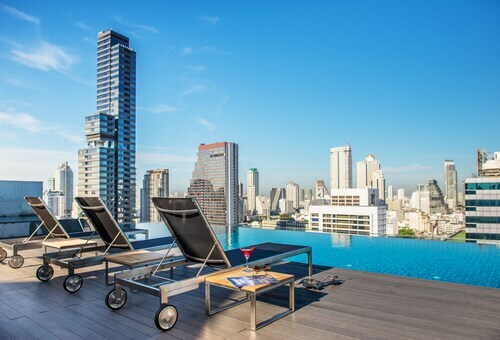 You’ll find a great selection of cheap hotels near Bangkok, luxurious spas and resorts downtown, and amazing accommodations throughout the city. You’ll save a lot of money, too. Maybe not enough to buy a massive jade Buddha, but enough to continue your quest for tranquility and inner peace on the massage table at a relaxing spa. Just breathe and leave the rest to us. Very friendly staff. Room was very clean. I would definitely stay there again. Everything was close and walking distance. Great location and beautiful hotel.